As we prepare for Holy Week and receive palm branches for church services, it’s easy to go through the motions and casually discuss the donkey and the palm parade, without thoroughly contemplating what it all means. This lesson reminds students of the significance behind the Triumphal Entry, and celebrates Christ’s work in our lives. Lesson focus: Jesus came to save in unexpected ways; we should remember this and be eager to share the good news with others. Palm Craft for Kids and Palm Sunday Coloring Pages included in the combined PDF above. 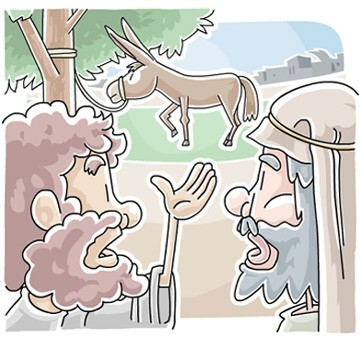 Don’t miss the video story of Palm Sunday for kids. Lesson Opening: Donkey relay and musical parade: have students participate in a two part game to introduce the story. Have two teams of kids form lines. Across the room, set out a variety of simple instruments (tambourines, party horns, drums, etc.). Instruct students to race across the room, going on all four like “donkeys” and bringing back instruments. After all instruments have been gathered, march around the room parade style, playing the music and shouting “hosanna!” Explain that today we will talk about a special kind of parade that happened in the Bible, and what happened leading up to Easter. This is a great story to act out with kids, either using puppets or live “skit” type action. If you are really brave or have a strong and sturdy volunteer with you, you may even act the part of the donkey and have students ride around the room! A donkey? So what? There are a couple of significant things about this ride. For one thing, riding a donkey was a sign of peace. Jesus was not riding in with a sword and a great white horse. He was demonstrating humility and true servanthood. Also, though, He was fulfilling a prophecy. Long before Jesus was born, a prophet had given a sign to look for to recognize the coming savior King. As Jesus approached the city, the people gathered and crowded around. They spread out coats on the ground, demonstrating their respect for Him as king. So what was happening here? The people gathered and cheered for Jesus. Some versions of the story use the word “Hosanna” which means “save us.” The people wanted someone who would save them from the cruel Roman oppression. They hoped Jesus would deliver them. Of course, He would save them from sin, but not quite how they expected…do we ever do this? We might hope God answers our prayers a certain way, but His methods are sometimes a little different. The grouchy temple leaders tried to get the people quiet. Look at what Jesus says, though. If they didn’t cry His praises, the rocks would! Well, we can’t let the rocks take our place, can we? We know and celebrate that Jesus came to save us and give new life. As we celebrate Holy Week, why don’t we think about some ways we can praise Him and tell others about Him? Craft: “Palm palm” branches: have students trace a hand (assist if necessary) on green paper. Stack varying shades of green and cut out the hands. Arrange the “palms” in layers and glue to a paper towel roll or long stick to make a branch. Palm frond fan: decorate a large green sheet of paper. Fold accordion-style to make a fan in the shape of a palm branch. Musical fun: in honor of the “parade” in the story, create musical instruments to celebrate, using paper plates or cups, shells or beads, and crepe paper streamers to decorate. Close with prayer and thanks to God for sending Jesus to save us. Ask for His peace when our expectations are not always met, and for joy in proclaiming the work of Christ. “You will find a colt” illustration courtesy of Christian Clip Arts. Used by permission.